Question: How many fingers do cartoon dwarfs have? In 1937 Walt Disney brought out 'Snow White and the Seven Dwarfs', a movie which was so good, so innovative and so full of quality that it is still being enjoyed today and is continuing to break records. This hub gives some facts which you may not know and is my tribute to the genius of the inspirational Walt Disney. OK, there are no spelling mistakes, I just can't resist a good title - the accepted plural of dwarf is, as in the movie, 'dwarfs' and has always been so. The spelling 'dwarves' was started by J. R. R. Tolkien to differentiate the dwarfs in his Hobbit novels from those in conventional fairy tales. 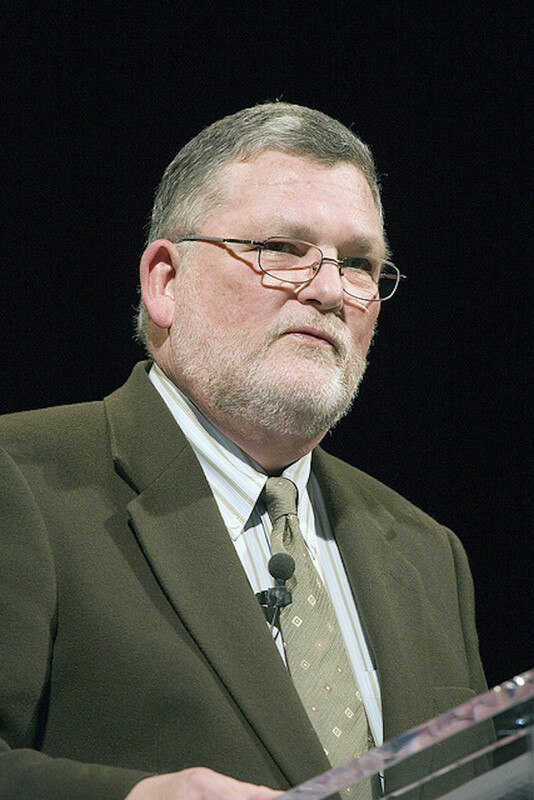 The plural for human beings of restricted growth remains 'dwarfs'. The movie represents a major cinematic milestone and was Walt Disney's first feature length animated film. It took almost four years to make. 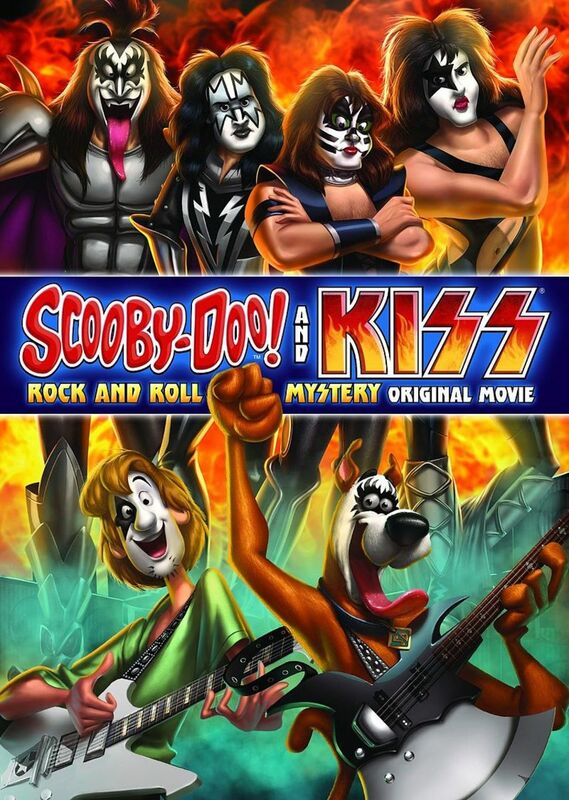 Until it was actually released it was referred to by rival producers as "Disney's Folly". No-one believed that audiences would come to a full length animated film. 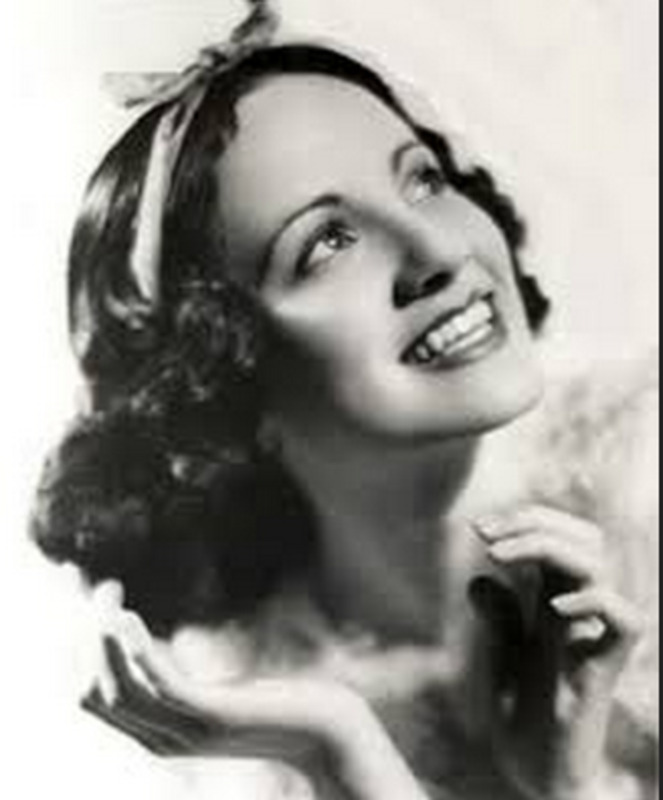 Even his wife, Lillian, told him: "No one's ever gonna pay a dime to see a dwarf picture". In the American film Institute's 2007 list of the 100 greatest American films of all time, 'Snow White' is the only traditionally animated film to be included. In 2008 the AFI nominated it as the greatest American animated film of all time. The movie was the first animated feature to be selected for the National Film Registry. A "special" Academy Award was granted to the picture "as a significant screen innovation which has charmed millions and pioneered a great new entertainment field". It consisted of one regular sized award and seven smaller sized awards and was presented to Walt Disney by 10-year-old child actress Shirley Temple. 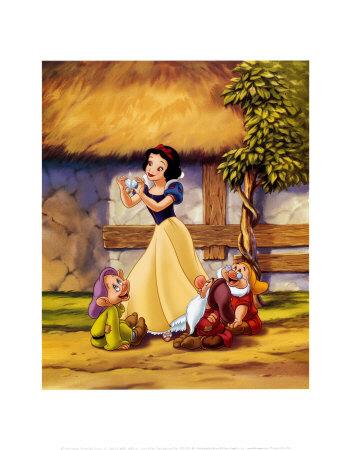 Walt Disney encouraged all staff at the studio to contribute to the story, offering five dollars for every 'gag'; such gags included the dwarfs' noses popping over the foot of the bed when they first meet Snow White. The film portrays eleven human characters but only the ones in the title have names. The Queen, the Prince and the Huntsman are never named. In the original fairy tale, the Queen dies when she is forced to dance in burning metal shoes. Disney dropped the idea. In the original Grimm tale the dwarfs had no individual names. The movie dwarfs' names have been translated into the language of every country where the film has been shown, including Germany, home of the original fairy tale. In the original tale, Snow White is not awakened by the prince's kiss. Instead, she awakens when a piece of the poisoned apple in her throat becomes dislodged as her coffin is taken towards the prince's castle. 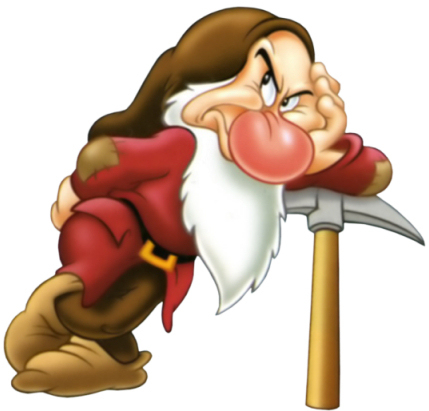 The biggest nose of the dwarfs is Grumpy's, by a mile. He also has one eye shut for much of the time. Pinto Colvig, who voiced Sleepy and Grumpy, was also the voice of Goofy in Disney cartoons. Dopey is the only clean-shaven dwarf. 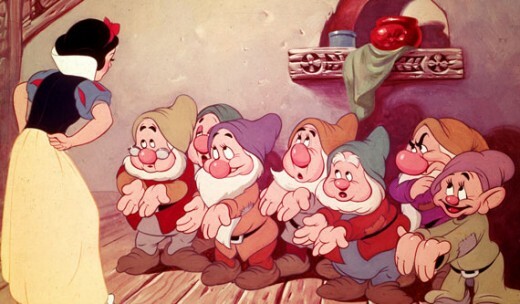 In the original proposal for the film, fifty ideas for the dwarves' names and personality traits were listed including all of the names finally used with the exception of Dopey and Doc. Some of the rejected names were: Awful, Shorty, Biggy, Blabby, Dirty, Gabby, Swift, Lazy, Gaspy, Gloomy, Hoppy, Jaunty, Jumpy, Nifty, Shifty, Deafy, Dizzey, Hickey, Wheezy, Baldy, Sniffy, Puffy, Stuffy, Hotsy, Tubby, and Burpy. 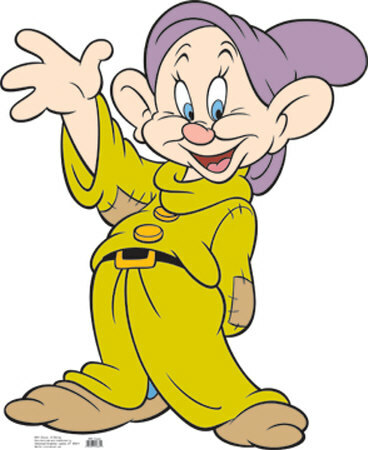 The most popular dwarf has always been Dopey - the last dwarf to be named. Here's how to remember the names of the dwarfs - and win Trivia quizzes for years to come: remember two S’s, two D’s, and three emotions. Two S’s: Sleepy and Sneezy; two D’s: Dopey and Doc; and three emotions: Happy, Bashful, and Grumpy. Visit Hollywood's Golden Age.com to read all about 'Snow White and the Seven Dwarfs', the classic Walt Disney animation film which set the benchmark for animated movies for decades to come. 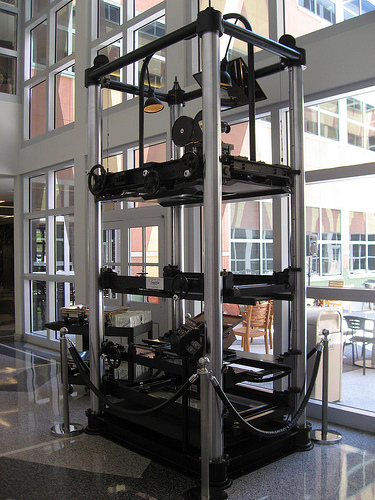 A four-level, twelve-feet-tall multiplane camera built by Walt Disney Studio in 1937. It today stands in the Frank G. Wells Building on the Disney lot in Burbank. It was the first full-length animated feature film to be made in Technicolor. All the art work is hand-drawn. Disney's technicians developed the multi-plane camera which separates the foreground overlay art, animation cells, and the backgrounds to create an illusion of great depth. It was first used in Disney's own animated, Oscar-winning Silly Symphonies short, 'The Old Mill' in 1937. Disney used the combined talents of 570 artists including 32 animators, 102 assistant animators, 167 assistants, 20 layout artists, 25 background artists, 65 effects animators, and 158 female inkers and painters. 2,000,000 illustrations were made using 1,500 shades of paint. The movie was a massive financial success and the Disney Studios in Burbank was built with the profits. RKO Radio Pictures put the film into general release on February 4, 1938, and it went on to make four times more money than any other motion picture released in that year. 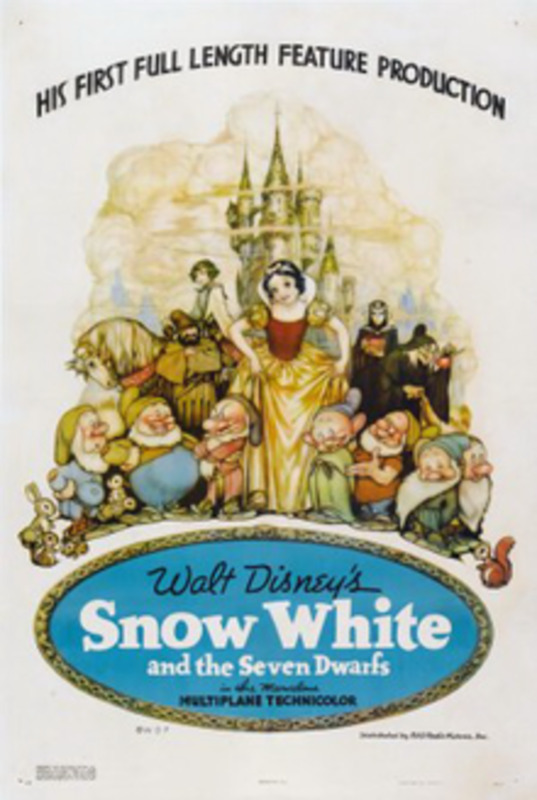 The first time merchandising licences were issued in respect of a feature film was for 'Snow White'. A total of 147 manufacturers were licensed to produce 2183 different novelty products. Sales of character dolls topped 2 milllion and eager fans purchased no fewer than 16,500,000 Snow White drinking glasses. The few that survive today command the prices of rare antique crystal. 'Snow White' was the first American film to have a soundtrack album released in conjunction with the film. Prior to this, a movie soundtrack recording was deemed of little value to a movie studio and had never been tried. In late 1994, Snow White was finally released on VHS home video (and laser disc) and sold 10 million copies in its first week of sale. After three weeks of availability, it sold over 17 million copies, and would soon surpass the all-time champ, Disney's Aladdin (with 24 million copies sold since its late-1993 release). It eventually sold 50 million copies worldwide, the best-selling cassette of all time. Held the title of highest grossing film ever for exactly one year, after which it was knocked out of the top spot by 'Gone with the Wind'. Made with an unprecedented budget of $1,488,000 it was the earliest film to earn over $100 million at the US box office. Sign up -- Absolutely free and takes just seconds --Then Create a Hub (your own Web article) quickly and easily--Then Make money when visitors to your Hubs click on ads. Worlds Collide in "Scooby-Doo and KISS: Rock and Roll Mystery"
Thanks Laurina, William and Glimmer, glad you enjoyed the hub. Very entertaining hub, gunsock. Thanks, and Heigh Ho! I hav a few Disney History Hubs of my own so I love learning new and iteresting things about everything Disney! Fun hub I enjoyed it. Thanks daisyjae, I'm glad you enjoyed it. There's no getting away from it, 'Snow White' is just a wonderful movie. I love this hub and this movie! Rated up and stumbled.